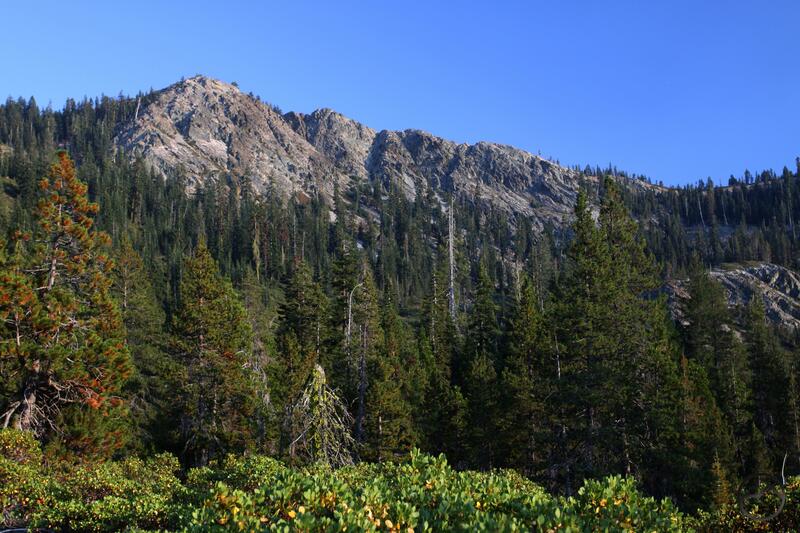 A trail that receives almost no use, the Soapstone Trail accesses a small pond and climbs through beautiful forest to a high ridge crest, where it joins the Pacific Crest Trail. 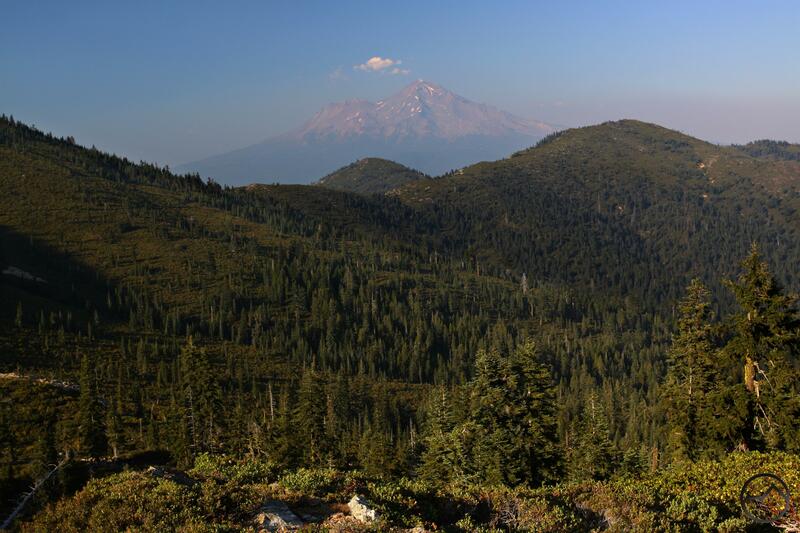 Once on the PCT, hikers can make a short jaunt to one of the most incredible vistas in the Mount Shasta Area. Grand view of the Castle Crags. Quite possibly the most forsaken and least used trail in the Trinity Divide, the Soapstone Trail offers hikers the opportunity to disappear into mountains that rarely feel the tread of hiking shoes. While it does not boast grand lakes, massive cliffs or vast meadows, the trail does offer many of the features hikers look for in trails, only on a somewhat more moderated scale. The trail accesses the small Soapstone Pond, passes through small grassy areas and offers good views of beautiful cliffs as well as vistas to the north that include pyramidal Porcupine Peak. All of this is arranged in an orderly fashion and makes for a pleasant hike. While it may lack scenery that rises to the level of the spectacular, it does offer deep solitude and a chance to enjoy the mountains without even the possibility of running into other hikers. This is true of the Soapstone Trail itself, at least. 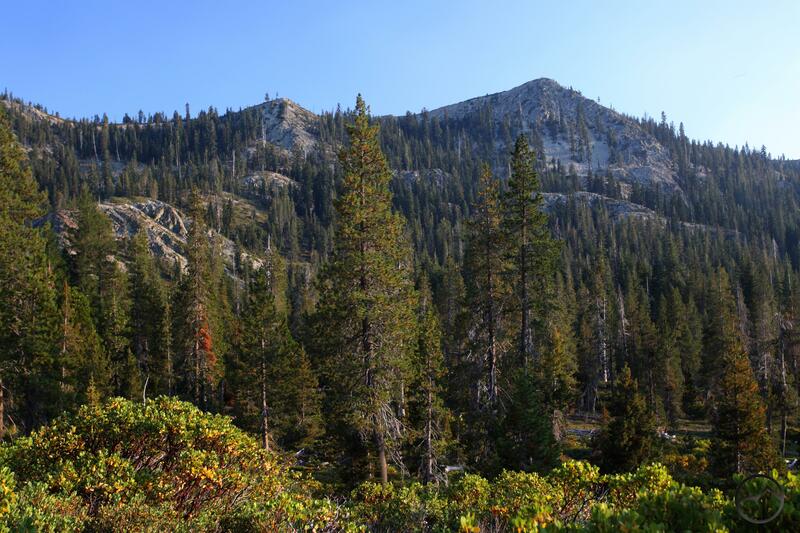 The trail is a rarely used path that is intended to access the Pacific Crest Trail during one of its longest roadless sections in all of Northern California. Understandably, isolation may be a bit harder to find once hikers merge onto the PCT. The payoff for the loss of solitude is the enjoyment of one of the most magnificent views in the Mount Shasta area. 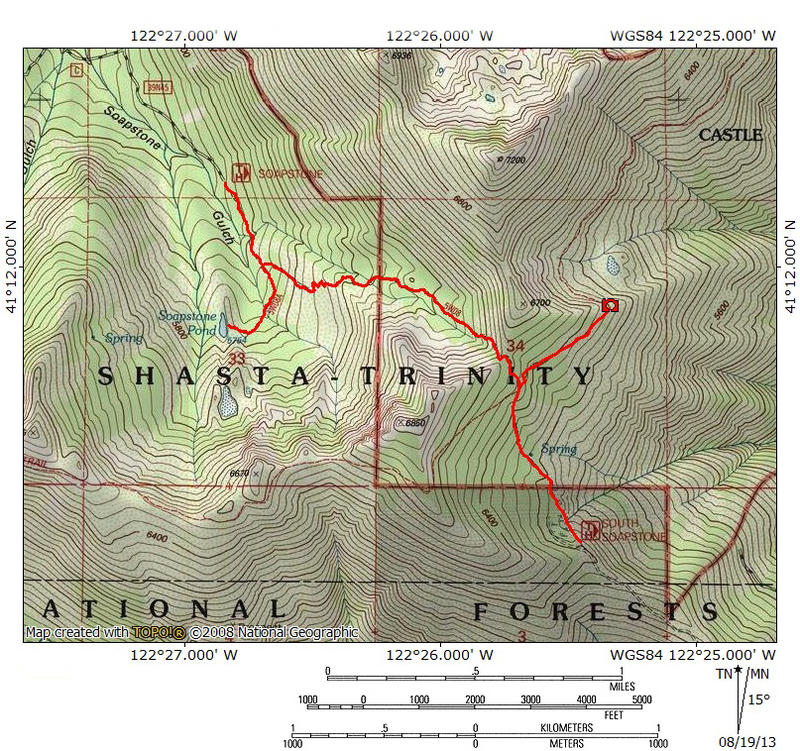 The PCT’s vista of Mount Shasta and the Castle Crags is monumental and a worthy destination for hikers on the Soapstone Trail who yearn for more than a lonely walk through the mountains. Most of the Trinity Divide’s use is focused on the great, central rib that extends eastward from the main crest of the range. 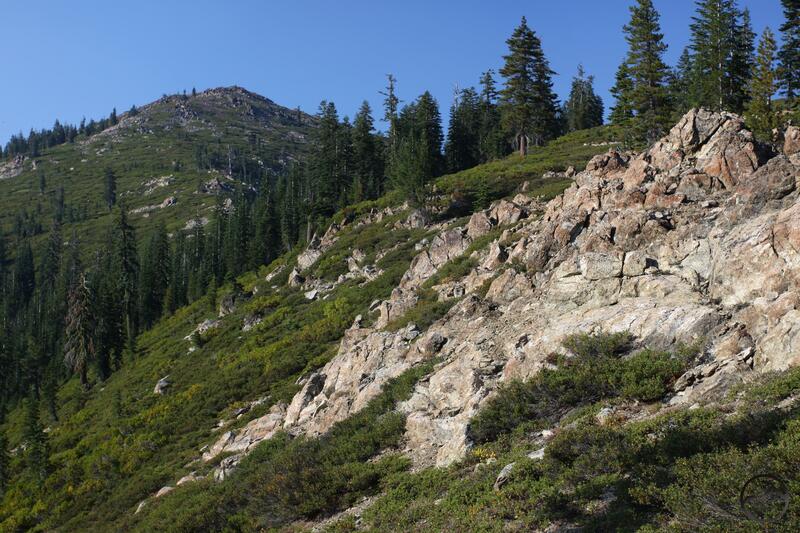 This section of the range includes the heavily trafficked Castle Crags as well as the Castle Lake area, accessed by a paved road, and the South Fork of the Sacramento River, which is also accessed via a paved road. The South Fork in particular has several trailheads and a great deal of dispersed camping. Consequently, it is one of the busier parts of the Mount Shasta region. The southern side of the South Fork is home to many lake basins, each of which is serviced by trails or rough dirt roads. The Soapstone Basin is one of these basins. Despite being the largest basin, The Soapstone basin is the only one that does not host a lake. Instead, the basin is occupied only by a small pond and an ephemeral tarn that dries up as the summer progresses. The lack of a lake has cast the Soapstone Basin to the very bottom of the list of trails to hike in the Trinity Divide. This is a shame because the basin is still beautiful and those who make the journey, as well as a quick jaunt on the PCT, are treated to one of the greatest of all visions to behold in the Mount Shasta area. The Soapstone Trail begins at a wide parking lot at the end of a rough dirt road. The road is not passable for low clearance vehicles. Hikers in these vehicles must park where the road splits and hike 0.6 miles up to the trailhead. At the trailhead, the pathway sets out to the south, crossing over large mounds intended to close the road of to vehicular traffic. The path is obviously an old road, though it continues to degrade into more attractive single track. About 0.15 miles from the trailhead the trail crosses Soapstone Creek, which is likely to be dry later in the season. On the far side the single track continues for only a short distance before regaining the badly overgrown road. Young lodgepole pines line the route. Roughly 100 yards from the creek, look for to large cairns on the left side of the trail marking the junction between the Soapstone Trail and the side trail that goes to Soapstone Pond. If intending to include the pond in the hike, head there first. The trail continues another 0.35 miles to the small body of water. On the way, it passes a few marshy areas and crosses another stream. About halfway between the junction and the Soapstone Pond, another pair of cairns lines the left side of the road. Disregard these. Though it looks like there may be a trail here it disappears quickly and is not worth the effort to find a pathway. Right before the pond the old road ends and narrows down to single track as it climbs over a low rise. On the other side lies small Soapstone Pond. Ringed with trees, it only rises to the level of “nice”, especially late in the summer when the water level has receded. Another, seasonal pond can be found to the south. To reach it, find the rocky gully that feeds down into Soapstone Pond. Scramble up the gully to the other lake, sure to be dry unless very early into the season. Returning to the junction with the main stem of the Soapstone Trail, the path shrinks down to faint single track. From this point onward the trail obviously receives very, very little use. Though the route is always obvious, at times it the trail nearly fades away entirely. Moreover, there is little sign of current wear. The trail stays level for a little while and then begins to climb more earnestly. After passing through a band of trees, it enters a large brushfield. A few switchbacks ease the grade a little bit but the trail is moderately steep along this section. Thankfully, this is one of the prettiest sections of the whole hike. Much of the Soapstone Basin is visible. The view includes a series of large cliffs immediately to the south as well as the walls of the Devil’s Pocket a little further to the west. A short distance beyond the brush, large grassy areas dotted with trees beckon explorers to delve deeper into the almost-never-traveled reaches of Soapstone Basin. Eventually the views end as the trail reenters the dense forest. As if in compensation for the lack of views, the trail levels off. It makes passes a small seep that still flows late in the year and then arrives at the crossing of Soapstone Creek. Just beyond the creek a sign marks the passage across the boundary of the Castle Crags Wilderness. Harry Watkins from the top of the Soapstone Trail. The corner of the Castle Crags Wilderness through which the Soapstone Trail passes is among the most remote corners of the entire wilderness area. 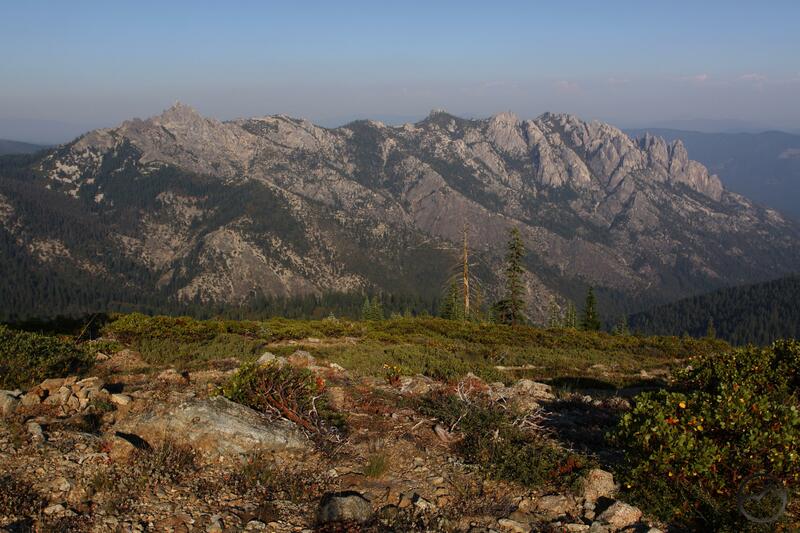 It consists of a small canyon tucked between the crest of the large central rib of the Trinity Divide and the summit of Harry Watkins (Peak), the highest point in the Castle Crags Wilderness. Though the trail climbs through this section, it does so at a pretty moderate grade. The forest is fairly open, with lots of space and grass between the trees. There are occasional views to the north, toward Porcupine Peak. Soon the trail settles in along the uppermost section of Soapstone Creek, along which it maintains a parallel course for approximately 0.25 miles. Finally, as the trail nears the headwall of the canyon it steeps remarkably. This section is thankfully short and makes a dusty switchback near the top of the canyon. A large rock outcropping marks the end of the climb and the view to the north includes the vast, brushy summit of Harry Watkins. The crest of the ridge offers no views to the south, however, because of dense forest of mountain hemlock. The trail descends another 0.15 miles to an obvious junction with the PCT. Mount Shasta presides over the PCT. Though the Soapstone Trail officially continues south of the junction for another 0.5 miles to the South Soapstone trailhead, it is much preferable to turn left onto the PCT. Doing so will yield one of finest views in the area. The PCT initially continues through the forest but soon it clears up a bit and the Castle Crags emerge to the southeast. Though the view is awe-inspiring, maintain course a little further; the view ahead is incomparable. Eventually the forest recedes and when the trail arrives at a shoulder on the edge of a vast basin, the grand vista unfolds. Immediately ahead of the trail is the giant headwaters basin of the North Fork of Castle Creek. The tall brush-covered point straight ahead is the backside of Castle Peak. Above the peak is the mighty cone of Mount Shasta, crowning the horizon. Below and to the right is the awesome bulk of the Castle Crags. The endless granite spires form a giant rocky knot. The clear line of the PCT can be observed zigzagging its way along the flank of this incredible formation. An obvious side trail leads to a level clearing on the shoulder where PCT’ers have established an obvious camp with room for 4 or 5 tents. Down below, to the north there is a small, seasonal lake a couple hundred feet below the trail. When it has water, it is a welcome diversion along this long, waterless section of the trail. 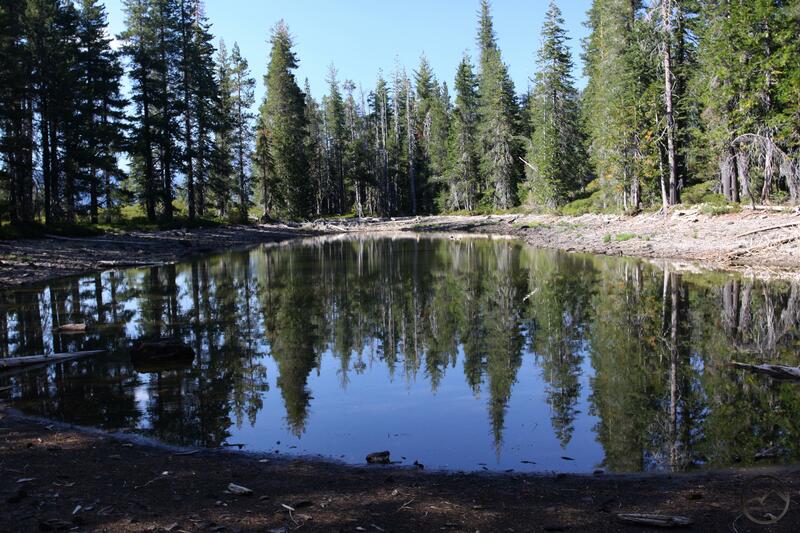 One must proceed a little further along the PCT to reach a suitable place to go cross-country down to the little lake. For those who opt to camp at this incredible vista, the sense of vastness and epic proportion will not be soon forgotten. Sunset is tremendous. From the town of Mt. Shasta, head west on W. Lake, crossing over I-5. At the stop sign, turn left onto Old Stage Road. After 0.25 miles, veer right onto WA Barr Road. Continue south, crossing over the dam that impounds the Sacramento River and forms Lake Siskiyou. From the dam, continue 9 miles to the west, passing the lake and continuing up the Sacramento River. After 9 miles, turn left, crossing over the Sacramento River on a Forest Service bridge. Veer left after the bridge, then make a sharp right hand turn onto Forest Road 39N45. The well-maintained dirt road may not be signed, but it is hard to miss. It parallels the river for 1.25 miles before intersecting Forest Road 39N41. Stay straight on 39N45. Continue for 0.1 miles to another junction. High clearance vehicles should stay left and proceed 1 mile up the rough road to the trailhead. Low clearance vehicles should park here and begin the hike up the road to the trailhead and onwards onto the Soapstone Trail. Thanks for the comments. I am glad the site has been useful! Your mileage is correct. I put the numbers in from something else. I normally double check everything but when I posted the page I also put up the Sisson-Callahan, Tamarack Lake and Gumboot Trail pages. I appreciate you pointing that out. It also means that the topo map is incorrect, showing the second junction too far from 39N41. As far as the sign, it must be new, as you noted. I will adjust my notes accordingly. Lastly, it is unfortunate the mountain was obscured by clouds. The view from the bivy site is astounding. It is one of the finest view points in the area! I’ll definitely be back to camp at that site. The sunset/sunrise views of the Crags and Shasta will be incredible. Would you like photos of the new signs to include on your page? I appreciate the offer but I try to keep the images on the site in a more macro context. It is just a style thing. I did remove the reference to the junction being unsigned though. I appreciate the update!